I am writing on behalf of Clean Air in London (CAL) to respond to the Mayor’s proposal for a so-called ‘ultra low emission zone’ (ULEZ). CAL submitted preliminary views at the meeting of the London Assembly’s Environment Committee on 11 July 2013 (which was attended by Transport for London (TfL)) and at a TfL stakeholder meeting on 14 November 2013. The Mayor announced plans for an ULEZ on 13 February 2013. CAL’s impression from the stakeholder event is that TfL will propose to the Mayor: the Euro 6 standard for diesel; and the Euro 4 standard for petrol for the Central Congestion Charging Zone (CCCZ) in 2020 for all categories of vehicles as part of a wider ‘Air Quality and Emissions Action Plan’. Such a scheme would be small, weak and probably five years behind leading cities like Berlin. Austria is already implementing a Euro 6 scheme for diesel vehicles. At the TfL stakeholder event, a show of hands confirmed no-one present considered 2020 to be an ambitious timetable for the ULEZ. This map is consistent with the European Environment Agency’s database showing that London has the highest levels of nitrogen dioxide (NO2) of any capital city in Europe. CAL urges the Mayor to follow key principles when determining the ULEZ(s). It seems TfL’s Vision for the ULEZ could: be small; be weak; exclude parts of the day; and may exclude several categories of vehicle. CAL considers TfL’s thinking to be far short of the Mayor’s Vision, even ‘lazy’, ‘timid’ and ‘unambitious’. 2. Why have an ULEZ? The WHO classified diesel exhaust as carcinogenic for humans in June 2012. In October 2013, the WHO went further and classified outdoor air pollution and particulate matter as carcinogenic to humans. The Mayor’s own estimates show that diesel exhaust is responsible for up to 30 times more NO2 and particle exhaust emissions than petrol. The Mayor’s Air Quality Strategy (MAQS) estimated that road transport is responsible for around 80% of PM2.5 emissions in London. Public Health England estimates that up to 8.9% of all deaths in London in 2011 were attributable to long-term exposure to human-made PM2.5. Last but not least, the European Commission is expected to set out a bold vision for action in its ‘package’ for the ‘Year of Air’. Even the Mayor’s own projections to 2020, based on emissions estimates that are likely to be 10% to 30% below real world emissions for NO2 and oxides of nitrogen (NOx), show the ULEZ needs to cover at least 11 inner London boroughs. By substantially underestimating emissions the Mayor may exponentially underestimate benefits. In CAL’s opinion, the Mayor, TfL and leaders of local authorities should consider themselves culpable for their respective parts in this public health crisis. Please also consider the Mayor’s responsibility under the Public Sector Equality Duty. Why also is TfL prioritising the safety of passengers ahead of the safety of those exposed to emissions from transport where it is the responsible authority e.g. buses, taxis and within the CCCZ and LEZ? 3. Who, What, Where and When? The Mayor should stop ‘crying wolf’ in claiming there are technology ‘silver bullets’ e.g. the Euro 6 standard for diesel. The problem is diesel exhaust and the solution is to ban it from the most-polluted places. The only questions are who, what, where and when? The primary ULEZ should set an age limit of four years for all diesel vehicles and 10 years for all petrol vehicles within the whole area bounded by the North and South Circular Roads by May 2018. Other hotspot areas might become secondary zones e.g. around Heathrow and in east London. The ULEZ(s) might be implemented as an age limit or implemented through a requirement applying the Euro 6 standard for diesel and the Euro 4 standard for petrol. Please however do not confuse the setting of such a Euro engine standard as a technology solution – instead it would simply be a blunt instrument for banning the oldest vehicles i.e. most cheaply. CAL understands that Berlin is considering tightening its existing low emission zone, which covers the most-polluted 30% of the city, to Euro 6 for diesel and Euro 4 for petrol by 2015. Berlin’s existing scheme has ‘small inputs’ and ‘big outputs’ and targets the most-polluted areas rather than imposing unnecessary burdens on those entering the relatively cleaner outer areas of the city. Austria is already implementing its first Euro 6 based low emission zone. A primary ULEZ should ban all diesel exhaust from the whole area bounded by the North and South Circular Roads by January 2020. The Mayor should follow his ‘Vision’ and be bolder still, fundamentally re-engineering London and tackling the short and long-term challenges, instead of taking successive backward steps. Any exceptions should be limited to those people and vehicles for which there is a genuine need and no other alternative is possible. 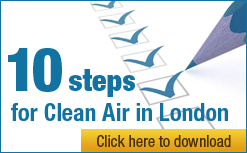 v. numerous other backward steps on air pollution e.g. scrapping the Mayor’s own proposal for a 10 year age limit for taxis. Please implement one or more bold two-stage ULEZs not take more backward steps. TfL consistently focuses more on its own costs and convenience than the benefits of ambitious schemes for: public health; green businesses; transformational change; and the avoiding of EU fines for failing to comply with limit values. TfL also muddles inputs and outputs, for example, considering the compliance rate for the current LEZ as an output not an input. Please do not claim emissions standards hit the poorest hardest – the simple fact is that the poorest, most vulnerable people have air pollution not vehicles. CAL understands the latest estimate is that air pollution ‘costs’ London about £2.5 billion per year. Currently, the Mayor seems to be considering solutions that are one or two orders of magnitude less than the problem. Berlin and New York have shown convincingly that the assessment of real world emissions and concentrations to identify the source of the most harmful pollutants can lead to the successful implementation of practical and effective measures. TfL’s modelling should include the benefits of behavioural change not just technology and other costs e.g. travel cost savings and health benefits from modal shift. At a minimum, the Mayor’s proposals for the ULEZ(s) need to be sufficient to ensure – with any other measures – full compliance with air pollution laws throughout London. Such testing could identify problems at an early stage and the need for further measures. Carrot and stick are both needed to tackle London’s air pollution problems if the city is to lead the world again as it did after the Great Smog of 1952 and the Clean Air Act of 1956. Please use the ULEZ area(s) to tighten emissions standards generally and catalyse other benefits across London and more widely e.g. as a focus for tighter controls for non-road mobile machinery (NRMM), taxis and buses. Please incentivise change and provide alternatives e.g. by building public understanding of air pollution and investing in ‘rapid’ charging for electric vehicles (i.e. 30 minute battery charging for cars, taxis and vans) and high return on investment cycling schemes like that implemented by Camden Council in Royal College Street and by the City of London and now being considered by the City of Westminster. London should apply for these structural funds to support the implementation of ULEZ(s) and related measures e.g. for taxis, buses, NRMM etc. Please stop hiding air pollution and ban diesel exhaust in two stages to 2020 as coal burning was banned some 60 years ago. CAL would be pleased to discuss these proposals with the Mayor or his team.